Sunwing’s senior Cuba-based official says Quebec and Ontario travel agents who visited Cuba’s Jardines del Rey region last weekend left believing it is deserving of a clean bill of health following Hurricane Irma, which battered the islands found off Cuba’s north coast in September. 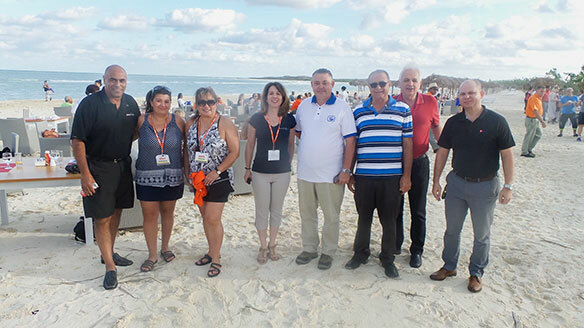 Sunwing and the Cuba Tourist Board brought some 140 travel agents to Jardines del Rey on Oct. 29 for a 24-hour fam, eager to convince them that an area that’s a cornerstone of Cuba’s tourist trade and which Sunwing has a large presence in is again ready to receive visitors. The islands of Cayo Coco, Cayo Guillermo and Cayo Santa Maria were closed to tourists following Irma, with authorities working to repair damage to hotels and other infrastructure. Most hotels on the islands were to reopen Nov. 1, and all are expected to be open Nov. 15. However, Cuban tourism officials have been concerned that many looking for sun vacations may avoid Jardines del Rey, concerned there’s still widespread damage. However, many hotel officials acknowledge the first couple of weeks following the reopenings may see relatively few guests. Many hotels have had crews working around the clock as they prepared to reopen, with shift changes enabling work to continue non-stop. Mohamad Fawzi Gonzalez of Blue Diamond Resorts said Irma “has been an opportunity for us to do a lot of things we wanted to do before.” Many hotels forced to close after Irma used their closures not only to make repairs, but also undertake renovations. Cuban tourism minister Manuel Marrero has also said that Irma deposited more sand on local shores, expanding the beaches that are the core of Jardines del Rey tourism. Fawzi Gonzalez noted Cayo Coco – the largest of the islands in Jardines del Rey – has seen a lot of rain since Irma, leaving an island that lost vegetation during the storm to once again look green. He welcomed Cayo Coco beaches receiving additional sand thanks to Irma. “Apparently bad things can bring good things,” he said. Fabricio Villanueva, general manager of the Ibersotar Playa Pilar on Cayo Guillermo said damage to his property mostly amounted to broken glass and toppled vegetation. Hotel staff among other things planted some 900 coconut trees as part of re-greening resort grounds, he reported. “Everything is up and running. Even if we don’t have clients, we’re ready to go. The only thing we need is clients,” said Villanueva, who conceded some people may be leery about visiting Cayo Guillermo this month. Meanwhile, one of the agents on the trip, Danuela Freel of Four Point Travel in St. Catharines, Ont., said resort employees were eager to see Canadians return.